For The Nature Conservancy (and indirectly the city of Semarang), who is working on the development of mangrove restoration scenarios for the north coast of Central Java, FloodTags will monitor and analyze online (social) media to identify new flood events and their characteristics and disseminate these to the ‘Coastal Resilience – Cities Mapping Portal’ of TNC. Rapid population growth combined with the impacts of the changing climate pose one of the world’s greatest threats that will continue to result in a staggering loss of life - pooled with overwhelming loss and damages to property, ecosystems and livelihoods, particularly in developing countries. Nature offers an innovative and cost-effective opportunity to invest in disaster prevention and preparedness, while realizing other quantifiable benefits, such as boosting tourism, food supplies, water quality, biodiversity and carbon storage. At the same time, the rise of social media has introduced a new method for communicating across geographic and institutional silos and provides a mechanism to gather data that can be useful for disaster preparedness, response, and recovery. The integration of social media-derived hazard data with social and ecological spatial data allows for improved hazard mitigation planning and decision making. For the Resilient Coastal Cities and Coalition Building Project, the American Red Cross and the GDPC are working with Red Cross/Red Crescent National Societies in Indonesia and Vanuatu to build local coalitions and thereby enhance community resilience. The project convenes coalitions of businesses, civil society organizations, universities, and other stakeholders, and equips them with a set of tools to better address coastal risk reduction and climate smart resilience within their existing governance and nonprofit planning processes. The goal is to design and implement tools to that identify viable adaptation solutions that build social and ecological resiliency and reduce the risk of city flooding and inundation. Identify new flood events for the North Coast of Central Java in the upcoming flood season 2017-2018 on the basis of Twitter data. Per identified flood event, provide the related Twitter content and summarize the known characteristics such as time, location, most frequent words and hashtags used. Per identified flood event, determine the uncertainty (of it being a flood event) and suggest whether (the extent to which) further validation of the flood is required, either by manual validation or data combinations. 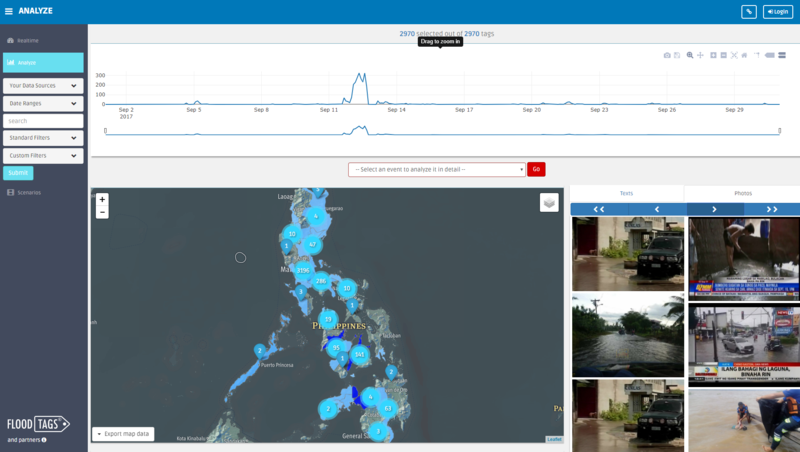 With the connection to FloodTags, Coastal Resilience will have the capacity to integrate social media flood mapping with social and ecological data in an online decision support tool for visualization. As follow-up, having developed an initial set of social and ecological geospatial data on Coastal Resilience, TNC will continue to organize these data, and fill in any gaps with relevant demographic, vulnerability, and ecosystem information for the city. The data is being provided by TNC Indonesia and colleagues at Mercy Corps, and will be validated by TNC, the Semarang Chief Resilience Officer, and others at the city-level government. TNC will then conduct an analysis that visualizes the mangrove restoration potential for Semarang, working with Wetlands International and other local partners. The goal is to develop future restoration scenarios, validated by current mangrove restoration along the north coast of Central Java, relating them to different flood projections, community vulnerability and risk reduction measures. Disseminate the results via an API that the ‘Coastal Resilience – Cities Mapping Portal’ can connect to by HTTP(S). (2) A dashboard that visualizes the information for use in disaster response. FloodTags will deliver two parts of the system: The HTTP API, distributing flood reports and their metadata (such as reliability), the geographical locations of the flood reports, as well as composite information, including geographic locations, related to flood events. This API will feed into an online dashboard, developed and hosted by FloodTags, that can be used to analyze and interact the data for flood response purposes. Additionally, the API will this geographic data to the ‘Coastal Resilience – Cities Mapping Portal’. The development of this portal falls under the responsibility of The Nature Conservancy, and falls outside the scope of FloodTags on this project. The content will be analyzed by FloodTags’ systems. Several analyses will be performed, including determining the locations reported in the content, validation of incoming data using auxiliary data sources such as rainfall and satellite observations, classification of the data based on machine learning, and the detection of floods based on the data. The results of these analyses include metadata for each message, such as the location of the message, reliability and classification, as well as composite data about events (time, location, impact). This information is stored on FloodTags databases, and distributed through the HTTP API. To be able to provide reliable information for flood response, both the API and dashboard will be optimized to perform in limited bandwidth/reliability scenarios. Filter and show individual flood reports from Twitter, their location on a map, and photographs attached to these reports. FloodTags will analyze and monitor Indonesian (Bahasa) real-time Twitter data. The temporal scope of the work will be the 2017-2018 flood season (availability starting from January 31st 2018). The geographical scope is limited to the North Coast of Central Java (Jawa Tengah), encompassing the Brebes, Tegal, Pemalang, Pekalongan Batang, Kendal, Demak, Rembang, Pati and Jepara Regencies, as well as the cities of Tegal, Pekalongan and Semarang. The goal is to derive locations from the data, up to the ‘kelurahan’ level (small administrative divisions), although whether this is achievable will depend on the level of detail in the incoming data.